KFC restaurants all over the UK closed down because they ran out of chicken. 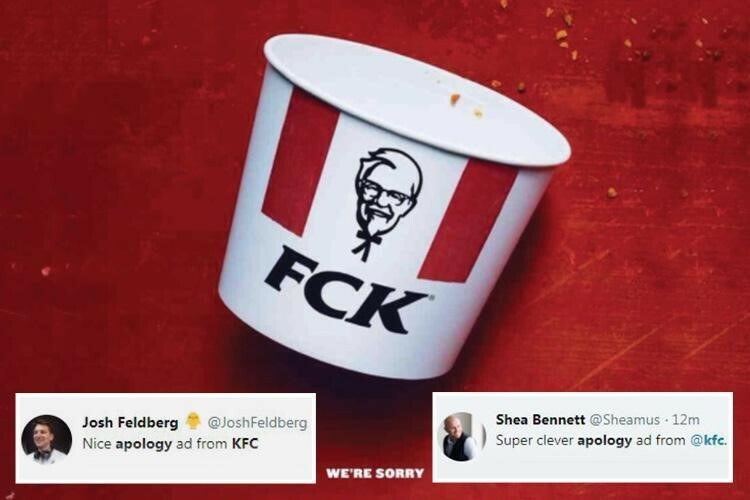 I would have loved to be in that KFC leadership team meeting. Your new supply chain partner has failed to deliver, and as a result, nearly all of your 870 stores across the country are shut down. No fresh chicken, no KFC. What to say to consumers? What to say to franchisees? What to say to the press? Should we just keep quiet and hope that it all blows over quickly? How about sending out a few platitudes in social media to calm the masses? I know, let’s shift blame to DHL, our new supply chain partner, who clearly was at fault. Or, do we own up to it, apologize profusely and just admit…. it was a major FCK up! Meghan Farren, CMO of KFC UK, chose the right path. You hunker down with your marketing team, you move quickly, you move intentionally and you come up with an apology. But not just any apology. An authentic apology. An apology worthy of remark. An apology infused with just enough self-deprecating humor to win over the audience and remind us all that sometimes bad stuff happens to good brands. And life goes on. It’s hard for brands to recover from a damaged reputation. What you do in the first few moments of a crisis can make a huge difference. Try to bury it or ignore it, and you may be facing a long struggle to restore the brand and you’ll probably lose a lot of customers along the way. Remember what happened to United? Even if you face it head-on with an apology, you may still suffer significant headwinds earning back trust with your customers. Just consider the ongoing struggles at Chipotle. Of course, you never want to find your brand in this kind of crisis situation. However, there are a few things you can put in place now to assure that if you do, you’ll be prepared. These 9 transformational marketing tips and actions will help you navigate the crisis and maintain, and if you’re lucky, even enhance your brand’s reputation. Mistakes can happen in any business, regardless of its size. You could send the wrong tweet, fail to meet a delivery time, or a product could be damaged (or go missing like the chicken!) during transit. Don’t allow one little mistake – or multiple mistakes – to damage your reputation and customer experience. If you make an error, own up to it immediately, apologize, and commit to resolving the problem as soon as possible. Your customers might be more understanding than you think, so simply do everything in your power to provide a solution to a problem to delight them, earn their loyalty, and generate advocacy for your brand story. Customers place a great deal of trust in a brand when they invest in their products and services. The ethical principles you live by will not only play an essential role in your sales and marketing campaigns, but they will also provide your employees with a set of standards to adhere to every day. Companies have a responsibility to their employees, customers and trading partners. Maintain a positive reputation by continually adhering to both your moral and legal obligations. For example, occupational, safety and health (OSH) should be a primary concern within any business, attend the annual ASSE conference to learn more about OSH training and education. A data breach could also provide a cybercriminal with access to your employees and customers’ personal information, which could have serious consequences for both them and your business. Check out the annual Billington Cybersecurity Summit to learn more. Cybersecurity is everyone’s responsibility – especially marketers! You must, therefore, protect your sensitive data as much as possible through data encryption, cloud solutions, firewalls and more. Do you want to be regarded as a trusted and reliable brand within your industry? You must keep your promises to your customers. So, if you say you will always provide free shipping, always provide your customers with free shipping. 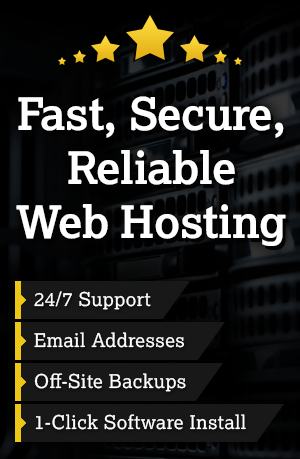 If you guarantee the lowest prices online, don’t be beaten on price by your competitors. If you don’t, your customers will view your brand as untrustworthy and will head elsewhere. Supporting your community can positively affect your reputation. You should strive to give something back at local levels to support worthy causes, which will allow people to place further trust in your business. People like to see companies helping charitable causes, and it helps to personify your brand. Don’t forget to promote your community work in the press, on social media and, of course, on your website. If you invest in your community, the community will invest in your brand. Remarkable customer experiences and exceptional service will encourage people to spread the word and tell the story of your brand. If you want to generate brand advocacy, you must engage and retain the best employees to assist your customers with a sale, problem, or query. A fast, efficient, and helpful customer experience will help you stand out from your industry rivals, and your reputation will always precede you. Every business will encounter an angry customer now and again. They might pick up the phone to scream at a customer service rep, write a negative review online, or they berate a salesperson in a store. We’ve all been there! Yet, it is important every employee responds to customer frustration in a polite, professional, and calm manner. Therefore, representing the brand well. Not only will this approach help you maintain the loyalty of an angry customer, but it will also prove to those prospects within earshot of the outburst that you are a helpful, rational, and caring brand, which will improve your reputation and increase your sales over time. There may come a time when the business might be forced to defend itself following defamatory comments. Contrary to conventional wisdom, the customer is not always right! For example, a dissatisfied customer may become hostile, and turn social media or the press to air their grievances. If this happens, you have every right to defend your brand to maintain your good standing in the industry. These days it’s not uncommon to encounter bad actors who will intentionally slander your good name. So, be prepared to refute any false claims with both passion and professionalism, which will mitigate or eliminate damage to your brand reputation over time. It is impossible to please everyone all the time. Every brand will get a bad review or complaint at some point, so don’t respond unprofessionally to a customer and take the rejection personally. Just reply in a polite, respectful, and fair manner, which will prevent you from turning a bad situation into a brand reputation crisis. Finally, it should go without saying that your brand reputation is your responsibility. Which means you have to be in the market every day listening to your customers, measuring their quality of engagement with your brand and responding to issues with ruthless consistency.If you can offer other helpful tips to maintaining and enhancing brand reputation before, during and after a crisis, please feel free to share your informative advice and brand stories by posting a comment below.